Fill a large saucepan 2/3 with water. Add 2 tablespoons of vinegar. Bring to a boil. In the meantime, place potato discs on oiled baking sheet in heated 350 degrees oven. Flip after 10 minutes to brown other side and top with back bacon. Reduce oven heat to 250 degrees. During this, prepare tomato salsa: finely dice all of the tomato, put in small bowl, add 1 tablespoon fresh chopped herbs, salt, pepper to taste and a drizzle of xtra virgin olive oil. Stir and set aside. Make toast. Break eggs in boiling water, cover with lid. Soft eggs will take 2-3 minutes. Set up: on plate, put potato topped with bacon, with slotted spoon, sit poached egg on top and cover with tomato salsa. Add toast sliced on diagonal and voilà! Enjoy. This dish is served with organic farmer's eggs,local asparagus (in season in June),our homemade 12-grain bread and preserves! 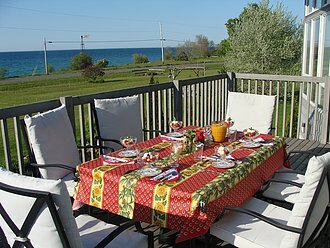 As soon as the weather cooperates, usually by mid-may, breakfast is served on our deck, enjoyed while taking in the views of the lake and breathing our fresh country air. Assemble dry ingredients in one bowl. Separate egg white and beat until stiff peaks. Mix together egg yolk, milk and maple syrup. Add dry ingredients and stir. Fold in beaten egg white until well blended, add melted butter. Heat griddle or non stick frying pan on medium low heat. Ladle mixture in small pancakes. Flip when bubbles appear to cook other side. Layer on plate until all mix is used up. Serve with syrup and fresh fruit. For a savory twist, omit maple syrup in batter, do crepes and layer with smoked salmon and plain yogurt, and garnish with fresh chopped chives, like the corn blini recipe in our collection. Also great for lunch with a glass of white wine, either Riesling or Pinot Gris! 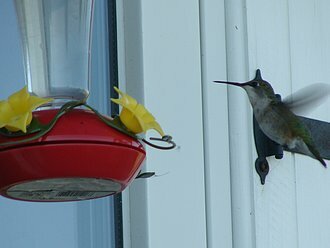 With any luck, once guests have settled in for breakfast on our deck, they will spot a hummingbird or two feeding from the nectar bottle hanging at our kitchen window. Now, that is the perfect way to start our day! Fresh fruit, Johnny's maple syrup and yogurt. My favorite time is early July, when all the local fresh berries are available...the last of the strawberries, the short season of raspberries,the black raspberries of our patch (if the birds don't get to them before me) and the beginning of the glorious blueberries,available till Labour Day. All tossed together with a stream of my friend's maple syrup, topped with natural yogurt and adorned with fresh mint that grows by our pond. They are your vitamins and one way to start off our great nutritious breakfasts. 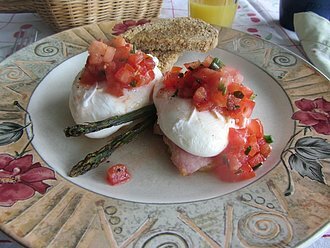 5 eggs, (break in a bowl and whisk) 2-3 egg whites (optional) 1/3 cup 10 percent cream (optional) 1 medium zuccini yellow or and green sliced 1 medium onion sliced 1 medium tomato diced cheese: grated hard cheese or soft goat cheese (optional) fresh herbs like chives, basil, thyme, rosemary. a mix of all adds great flavour. Use what you have on hand. 1/2 cup grated cheese (any kind, whatever you prefer) cheese is optional, the frittata will set without it. Turn oven on broil. On medium heat burner, in medium stick free frying pan, drizzle 1 tablespoon regular olive or canola oil. Add sliced zuccinis and onions and sauté until partially soft. Add diced tomatoes and herbs, salt and pepper. (Go easy on the salt if you are adding cheese) Cook slightly and add whisked eggs. With rubber spatula, stir egg mixture from the outside to the inside gently, mixing raw and cook. When eggs are slightly set, dot top with cheese and finish by placing pan under broiler for 1 minute, until top is golden brown. Remove from oven and let rest for 1 minute. You can cut in 4 portions or you can slide whole frittata on a pretty plate and bring to the table. Great buffet item. To slide out of pan, with rubber spatula, loosen edges first, shake pan gently to the plate, pushing it off with the spatula. Other veggies can be added or replaced, like mushrooms, blanched broccoli, peppers. Great way to use up cooked vegetables from evening's dinner. Smoked salmon, ham, italian sausage also can be added. Serve with toast or serve at lunch or light dinner with a salad.It's also great cold and travels well for a picnic. Make a big one and enjoy leftovers. Bonne chance! Whisk eggs with milk and yogurt, stir in apples. Mix dry ingredients and fold in egg mixture. Add melted butter. Heat up pan or griddle on medium heat. Spray with Pam. Drop batter by tablespoons, as many as the pan can take without cakes touching. When edges are brown, flip pancakes and slightly flatten them with the back of a spatula. Keep pancakes warm in 250 oven while making the rest of batter. 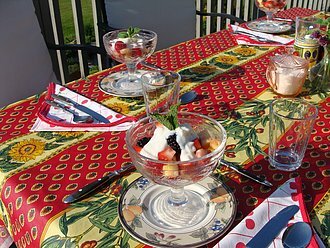 Serve with fresh fruit and maple syrup. Absolutely yummy. Apples in batter can be replaced by a cup of fresh or frozen blueberries. Corn blinis with smoked salmon, chives and 'crème fraîche'. For the adventurous guests, this is a savory twist on our pancake recipe, posted on our site. Adjust the recipe by replacing the sugar, cinnamon and apples with 1 tablespoon of fresh chopped chives and 1 cup of cooked fresh or frozen corn kernels. Prepare the pancakes, keeping them warm. 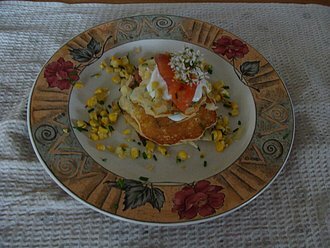 Using 3 pancakes per person, layer with one slice of smoked salmon and unsweetened yogurt, finishing with the salmon and yogurt and garnishing with more chopped chives and corn kernels. For a more luxurious touch, top with a teaspoon of caviar or local fish roe. This is a festive and nourishing dish, perfect for a brunch/lunch affair....pair it with a flute of your favorite sparkling wine or champagne! Great companion to omelettes, frittatas, chili or on it's own. Heat oven at 325 F. Spray a loaf pan. Blend all dry ingredients. Whisk together milk, egg, grated zucchini, cheese and chives. Fold in dry ingredients and stir well. Mixture will be thick. Transfer to loaf pan and bake 50-55 minutes in regular oven or 45 minutes in convection oven on middle rack. Let cool in pan 10 minutes and turn out on wire rack to finish cooling. Slice or store in fridge until ready to use. Freezes very well. This bread is addictive...Enjoy! In bowl, mash banana with fork, stir in egg and milk. Add cranberries and nuts. In seperate bowl, mix dry ingredients and fold in egg mixture. Butter or spray with pam a 12 muffin pan. Spoon in each slot mixture. Bake in preheated oven for 23-25 minutes, until golden brown. Let rest and remove from pan. Serve with butter and preserves. CORN MEAL muffins: Preheat oven at 350 F. Mix together and allow to stand for 5 minutes: 3/4 cup cornmeal and 1 1/4 cup milk Stir together 1 cup spelt flour, 1/3 cup granulated sugar, 3 tsp baking powder, 1 tsp salt. In a bowl, beat one egg, add milk cornmeal mixture, 1/4 cup vegetable oil. Stir in dry ingredients. Filled greased muffin pan half full and bake at 350 F in convection oven 15 minutes, or regular oven 20 minutes on middle rack. Do not overbake or will be very dry. For a savory muffin, omit sugar and replace with chopped ham, chorizo sausage or smoked salmon.